Wishing all of my lovely friends and your families a very Happy and Prosperous New Year 2015. 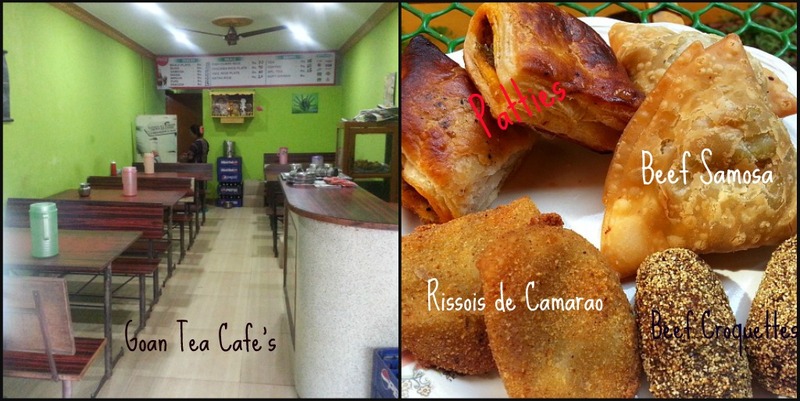 Sharing with you today a staple snack in Goa called Patties (pronounced as pat-tis). 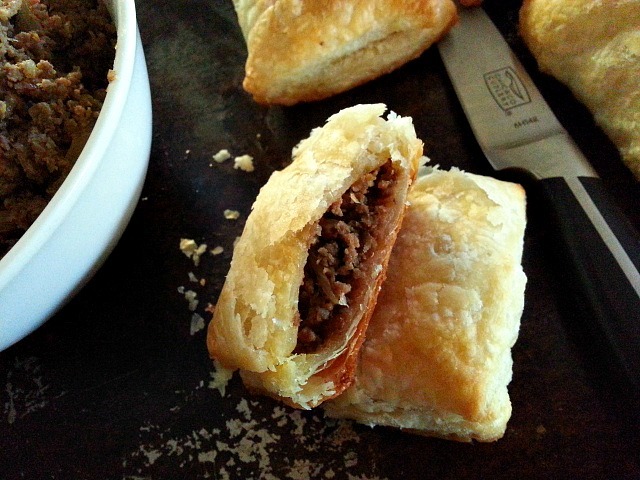 A light snack stuffed with spiced ground beef in a puff pastry shell. Patties were only made with ground beef. Now a days you can find it made with chicken and potatoes. Before all the fancy cafe’s in Goa there were tea stalls, small mom and pop cafe’s and bakeries were Patties were on the menu. Bakeries during the 80’s and 90’s had very limited choices. Fresh bread was baked 2 times a day and a few snacks and sweets. To name a few Nankhatai (cookies made with flour, sugar and butter), Botta (baked crisped sweet bread sticks), Kaankana( Goan toasted hard Bagel), Angel Wings ( Palmier’s) and Plain Toast. I remember as my dad would get these all the time for our evening tea. 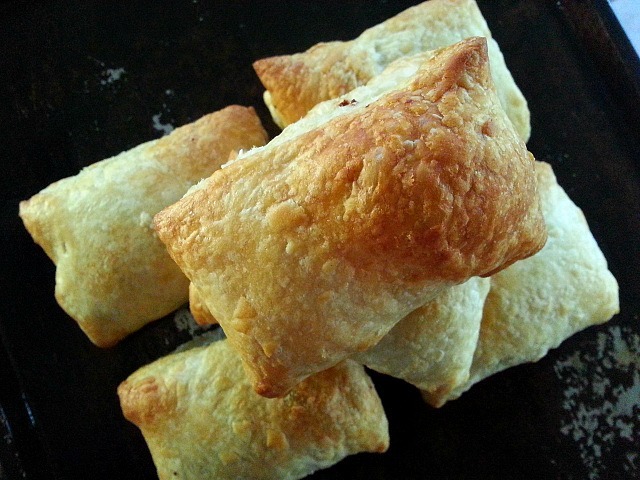 Usually Patties are not made at home but are bought from the bakery or cafe’s as puff pastry dough is hard to find in the stores and not too many people know how to make puff pastry dough. It’s a different story now a days. 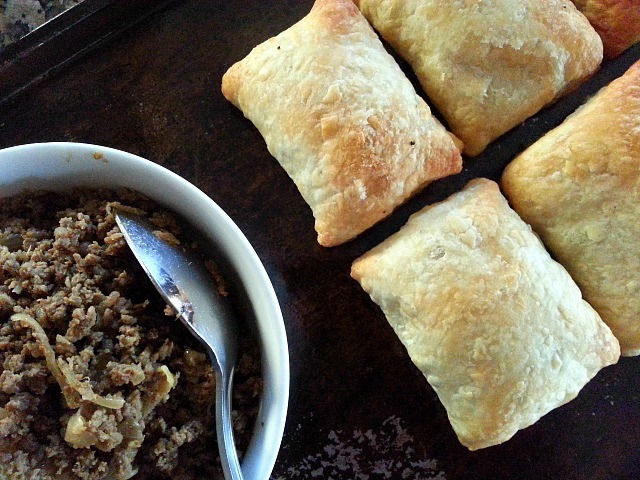 All you need for this recipe is to make Mince Meat (cooked ground beef) which you can make in advance and then stuffed in puff pastry dough and baked. Heat oil in a pot, saute the onions and ginger till onions are translucent. Add the xacuti masala and saute for 1 minute. Add the vinegar, sugar and saute for a quick minute. Next add the ground beef and mix it well with all the spices add water and salt to taste and cook covered for 20 minutes on medium heat. Uncover and cook for another 10 minutes till all the water dries. Take 1 medium diced onion and brown it with 1/2 tsp of sugar and salt, till light caramelized. 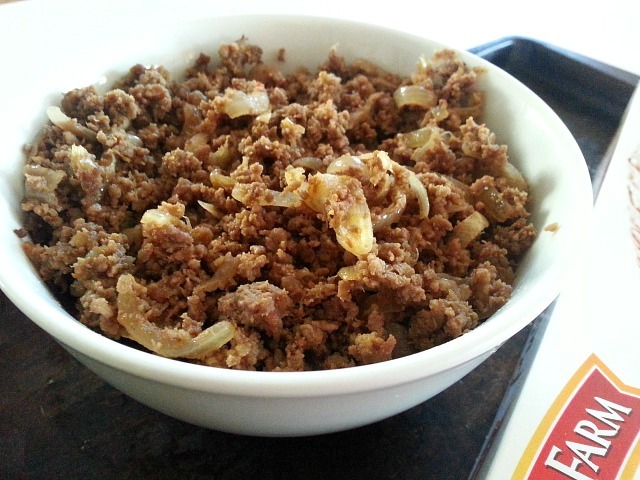 Mix it together with the cooked ground beef. Let this mixture cool. Divided each thawed sheet into 6 equal portions. On one half of the part place a tablespoon full of ground beef. Fold the sheet and press all the side together as a nice rectangle. Continue with the above step for each cut out part. Line the patties on a sprayed cookie sheet. Lightly brush with oil/melted butter on top. Bake for approx 15 minutes till crust is light golden brown and puffy. Not a meat eater then we have the Vegetarian Patties Recipe for you. 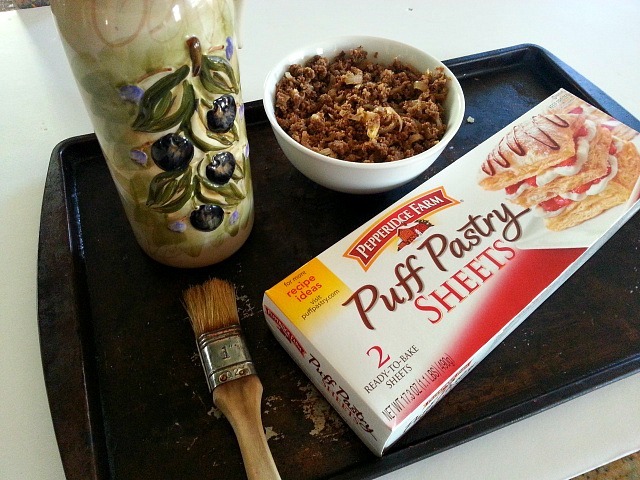 Just stuff the puff pastry with any cooked vegetables or cooked mushrooms. Serve hot for brunch or as a snack. Thank You so much Brienne, that was very sweet and kind of you. Hi, Nandini,thanks for stopping and liking my blog. Looks good! And simple to do! This looks amazing! Is there a difference between this Pattie recipe and Samosas, as far as ingredients? Or is the only difference frying vs. baking? I haven’t had a good Samosa since I was in Kenya and the photo you showed looks so delicious, I can’t wait to try this out, and the Samosas if you have a recipe for those. Thanks for sharing! Hi Aaron, I know that Kenya has a huge population of Indian’s and finding good Indian food should be easy. There is a difference in the crust of the samosas and patties. Samosas uses a dough crust like a wonton or spring roll wrapper and it is deep fried while patties uses puff pastry dough and is baked. Hopefully soon I will have a recipe up for a vegetarian samosas since you gave me the idea :-). Have a great weekend. Awesome! 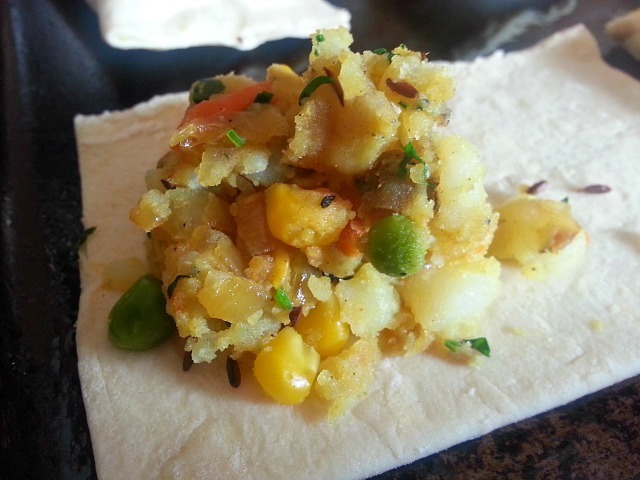 I had a delicious lentil samosa in Nairobi and would love to make them sometime. I look forward to the post! Fantastic recipe.We have similar Patties recipe we call it ” Shamburak” Its a Lebanese recipe.Thank you For visiting my blog.Best wishes. Thank You and thanks for sharing about Lebanese cuisine. Oh I would just live these ! These look great– I am trying it! I hope you do and a Very Happy New Years to you too :-). Those look yummy. Thanks for sharing. My pleasure and Thank You Connie! That’s awesome Melanie, please let me know how it turns out. Thank You Cheryl!. Wishing you too a very Happy and Prosperous New Years. Wow, Nandini, these look great! Happy New Year! Thank You Debbie, Wishing you too a very Happy and Prosperous New Years! 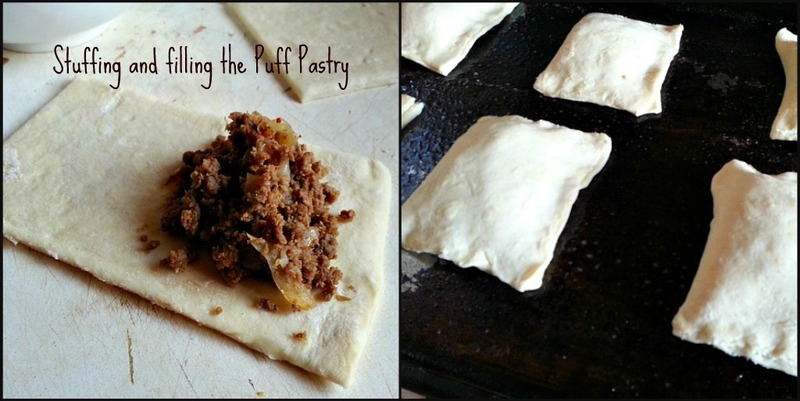 I love puff pastry parcels and the filling in these sounds so tasty. Thank You Juesseppi! Appreciate the reblog. Happy New Years! Yum. Never had – pinned for later. Happy New Year! oh yum!!! My grandmother made similar ones…a little difference on the recipe. Always loved it with potatoes…delicious!! Nandini, I love Patties too! The mention of botta makes my mouth water! Great post as usual! Happy new year to you. These look delicious. Love ginger!